This guide describes the several tiles new to DC5: the differently colored teleporters, the turn switches, the wall with ice, and the yin-yang collectible. Purple and cyan teleporters work like any other colored teleporters. A purple teleporter hooks up to another purple teleporter, and a cyan teleporter hooks up to another cyan teleporter. White teleporters are hooked up not by color but by their "numbers", which can only be seen in the editor. White teleporter #1 hooks up to another white teleporter #1, white teleporter #2 hooks up to another white teleporter #2, etc. In-game, it's impossible to tell which white teleporters are linked until you go into the white teleporters yourself. Pressing one of these switches rotates the entire level, including most elements and what direction they're moving in. A switch with a left arrow rotates it by 90 degrees counter-clockwise, a switch with a right arrow rotates it 90 degrees clockwise, and a switch with a semicircular arrow rotates it by 180 degrees. 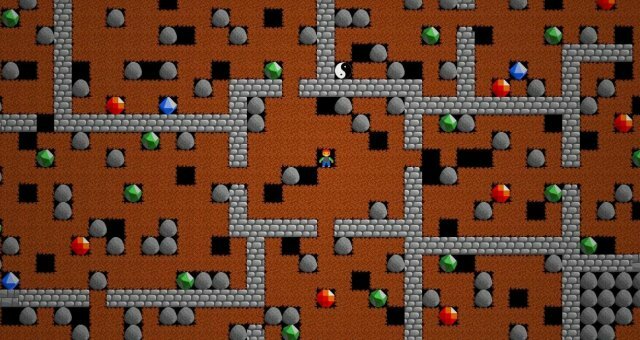 Note that while most tiles with directional variants will be properly rotated, remote bomb controls will not. Whether this is a bug or a feature is up to interpretation. 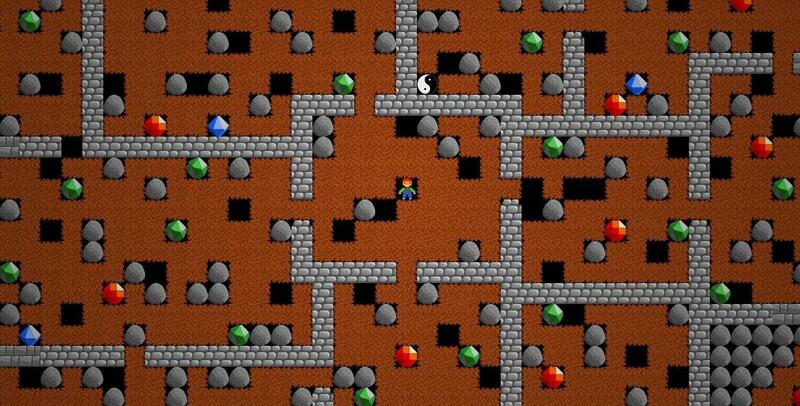 Rocks that are between quicksand tiles when a turn switch is pressed will be lost forever. 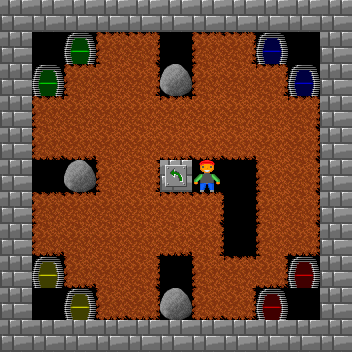 Replicators and conveyor belts do not have proper directional variants, and so placing a turn switch in the same level as a replicator or conveyor belt is forbidden and will prevent the level from being playable through normal means (unless any of the elements started inside of an Eater, in which case they do not count against the validity of the level). This is a destructible wall with a sheet of ice on top. If an object with gravity is pushed on top of one of these walls, it will continue moving in the direction it was pushed regardless of whether force is still being applied to it. Oddly enough, gems and nuts - which can fall off of normal flat walls as if they are slippery - will not fall off of this wall. Icy walls also cannot be destroyed with hammers. 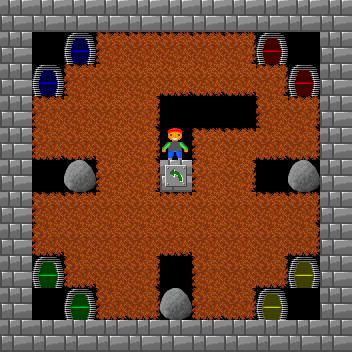 The yin-yang is a collectible item with no inherent value, like a key that does not open anything, but there is a twist to it: once you collect a yin-yang and make it to the exit alive, all yin-yangs in the level (excluding the steel sign yin-yangs, of course) will be replaced with empty space on subsequent playthroughs, and the only way to negate this effect is to completely wipe your save data for the collection that contains the level. If you get a yin-yang and make it to the exit alive in a normal level, that level will gain a yin-yang symbol next to it in the level select screen. For every four normal levels you complete after collecting a yin-yang, you will unlock a new level from the bonus levelgroup. Bonus levels are unlocked in ascending order: level 1 is unlocked upon gaining 4 yin-yang symbols, level 2 is unlocked upon gaining 8 yin-yang symbols, level 3 is unlocked upon gaining 12 yin-yang symbols, etc. Bonus levels track yin-yang collection the same way normal levels do, but they do not show if you've collected a yin-yang or not in the level selection screen, and collecting yin-yangs in them will not unlock anything.